Country Manor is very friendly and clean, and the people are easy to work with. They were able to show us around both buildings and the courtyard. They said that even when you're there for the day program, you'd still have a room. The rooms are very nice and clean. Thank you for visiting our community! We are very proud of the welcoming atmosphere and our dedicated team. Please come back and visit us again soon - we look forward to the opportunity to care for your loved one! My Mom was a resident at Country Manor Davenport. Be sure to ask lots of questions about when your loved one no longer qualifies to stay there. My Mom was refused the right to come back to her home after a short stay in the hospital. We were given short notice to find another home for her. I feel a home that truly cared about the families and residents could have offered more compassion than what was shown. My mother was in Country Manor, and it was wonderful. It was a great place, but we had to move her out, and they helped us find a new place, so we're very happy. She was in a room with another resident, but it was big, very nice, and clean. They had activities for different types of stimulation, she has dementia, and it kept them busy. They have personal caregivers for each resident, and it was a very nice situation. It was very homely. We took my mom to Country Manor in Davenport, and that is where she is. It has been wonderful. We are perfectly satisfied with the care she is getting. It is a fantastic place. They are very family-oriented. They take care of us as well as our mother. It is a really top-notch place. My mother is recovering well in Country Manor, and I am extremely pleased. The staff is very caring and very professional. The room is nice and clean. It is an up-to-date and attractive place. The grounds and location are excellent. It is in a friendly neighborhood, so it does not have an institutional feel about it. It is very home like and has good food. It is very nice and the price is very reasonable. I will recommend this to others. Country Manor Memory Care was small with a very limited number of residents and seemed dark and not very inviting. We feel that our father will not be happy there. It’s a very nice facility but it’s way too small and very limited of what they do at the facility. The director of the facility gave us a tour; he was very pleasant and very accommodating. There are some activities for the memory care patients to do and board games. Other than that, I did not see a whole lot. They have a nice garden are in the back. My mother is at Country Manor. She has been there for two years now. I can't say enough good things about them. The people that work there are amazing. They keep in constant contact with me. They are so caring and involved with the residents. They have fabulous activities. The place is spotless. I couldn't have picked a better place for my mom. I would highly recommend this facility to anybody that is in that area. Country Manor Memory Care is not too big, but not too small. It's has a nice and clean atmosphere. The staff are friendly and just very caring. They are not overly expensive. My aunt lives there. Her room is a nice-sized room, and it's nicely decorated. It's well lit with nice windows. Their dining area was very nice. I didn’t taste their food, but it looked OK.
As dedicated memory care experts, we recognize the fear and distress caused by this debilitating disease and we are here to assist residents and families navigate this traumatic terrain. From the start, we aim to build a deeply rooted relationship and connection with your family that brings peace of mind and answers to the difficult questions that arise, and to provide relief, letting you know that you and your loved ones are embraced by a community that truly cares. Our professional, 24-hour staff is dedicated to enhancing the quality of life for our residents and providing the high-level of care they deserve. 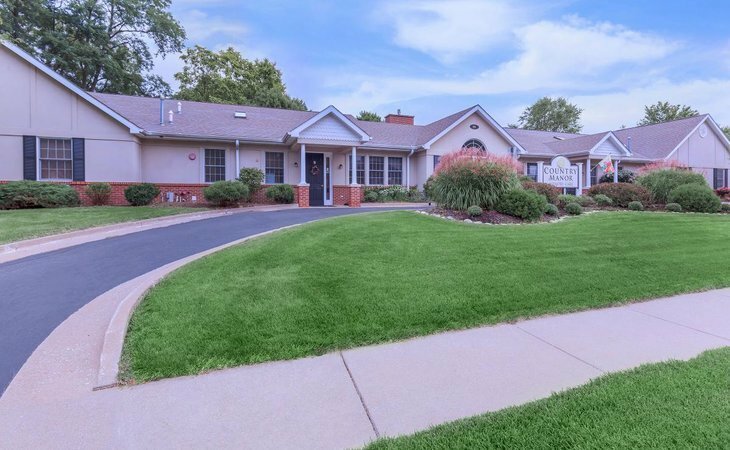 We are Davenport's Only Free Standing Memory Care Community Offering Levels of Care, a warm and Home-like Environment and short term respite "Graceful Stays." What should caregivers and potential residents know about Country Manor?